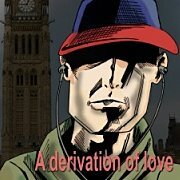 A Derivation of Love is a very short novel that was arguably seventeen years in the making. In 1993, for my OAC English Writing major project, I wrote a mostly-autobiographical "day-in-the-life-of" short story called (I think) "Of Far Too Many." Clearly, I wasn't a terribly happy adolescent. In 2001, when I felt it was time to tackle my first novel, I asked a friend if I should write a science fiction novel or a more-typical-for-a-first-novel semi-autobiographical coming-of-age story. He voted for the latter. Remarkably, I had managed to hold onto an electronic version of "Of Far Too Many," and it became the starting point for the novel. Eventually, a much revised version of that 1993 story became the second chapter. In 2006, after the long hard push to submit my PhD thesis on time, I suddenly had plenty of time and a brain that was firing on all cylinders. I finished Paris is Dead and pretty much completed A Derivation of Love in a couple of months. Although I had been working on it, off and on, since 2001, I don't recall having gotten very far. I think most of it was written in a couple of months on Waiheke Island in New Zealand. In 2009, a conversation with a friend -- and a very sharp reader -- convinced me that one simple but important change was needed to finish it. A year later I decided to test Amazon's self-publishing service. It was so easy that the book was "published" before I knew it. The full text of the novel is available right here. Please let me know what you think. 9. Friday, September 14, 2001.